For ultimate versatility, pair an aerodynamic midweight bullet like the Hornady 250-grain GMX (left) loaded fast with a heavy, tough bullet like the Hornady 300-grain Bonded DGX (right). With loads like these, you can drop a wolf way out yonder or a marauding grizzly at fish-breath distance. Often called the single most versatile, most capable cartridge for hunting everything on the planet, the .375 H&H is powerful enough for elephant, flat-shooting enough for deer and antelope out to moderate ranges, and not so hard-kicking that most serious hunters can’t master it. Interestingly, as great as its reputation is, the cartridge has unexplored potential. 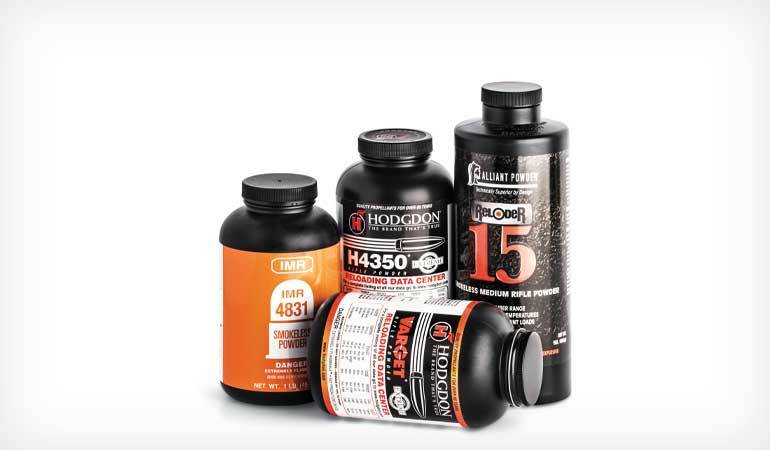 With judicious handloading it can offer hard-hitting, deep-penetrating performance on dangerous game that nips at the heels of the various .416-caliber rounds and can reach across eyebrow-raising distances to take hooved game. With velocities and ballistic coefficient numbers that rival the very best .308 Winchester loads, the .375 H&H can reliably ring steel plates at 1,000 yards. Yep, I’ve done it. When Great Britain’s Holland & Holland rolled out the .375 in 1912, it was only the second belted cartridge in existence. It would go on to sire every popular belted magnum available today, serving as the parent case for everything from the .257 Weatherby Magnum up through the .458 Lott. Designed with a pronounced taper—an element that helped prevent cases charged with the era’s rather unstable propellants from sticking in the chamber when fired in tropical temperatures and also enabled, and still does, cartridges to flow like silk from magazine to chamber, a characteristic much loved by dangerous-game hunters—the .375 H&H utilizes the belt to headspace against. With an overall maximum length of 3.60 inches, the .375 H&H is a true magnum-length cartridge. This length enabled adequate case capacity even with the strongly tapered body as well as just the right amount of neck length to grip projectiles in secure, concentric fashion. Two much-loved traits of the .375 H&H are its penchant for accuracy and its tendency to shoot various loads to a similar point of impact. As with any cartridge, the .375 H&H’s suitability for various purposes is determined by bullet selection. Thanks to over 100 years of continuous use and tremendous popularity, a wide variety of .375 projectiles is available. 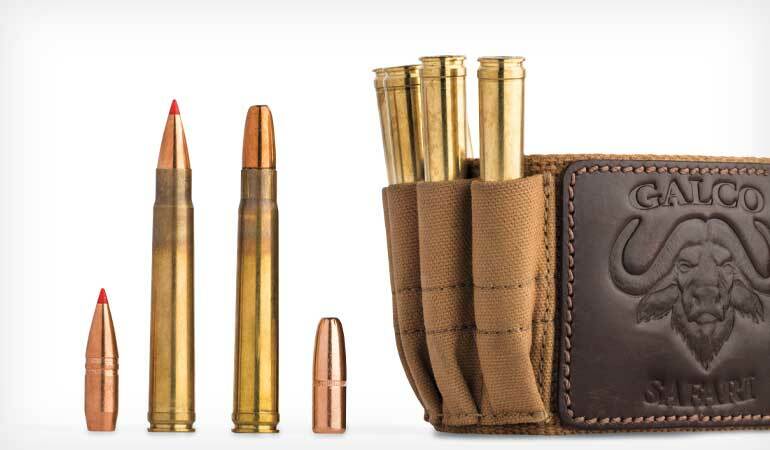 A brief look at the all-around bullets that made the .375 H&H the versatile tool it is reveals probably the most common (and best) are the various 300-grainers. A hunter armed with 300-grain softs and solids—soft expanding bullets for thin-skinned game and broadside shots on dangerous species like Cape buffalo and the biggest bears and solid non-expanding bullets for the pachyderms and for follow-up shots on wounded buffalo and whatnot—is well prepared to hunt anything in the world to distances of 250 yards or so. That distance can be stretched a bit by using one of the more aerodynamic softnose designs available, such as the Nosler AccuBond. I’ll go into those in a bit. Historically, bullets of 270 grains are also a versatile choice. They are popular for America’s various deer up through moose and for plains game in Africa. Bullets that fall out of the typical weight/shape parameter and provide enhanced, specialized performance can be divided into those heavier than usual, those lighter than usual, and those with either an unusual construction (monometal) or an unusual shape. The latter typically take the form of expanding bullets with increased aerodynamics and are potentially the most useful of all the .375 bullets. Some very savvy hunters, such as Craig Boddington, who is undoubtedly the most experienced hunter/writer alive today, suggest that the ultra-heavy .375 bullets aren’t necessary, and they probably aren’t. 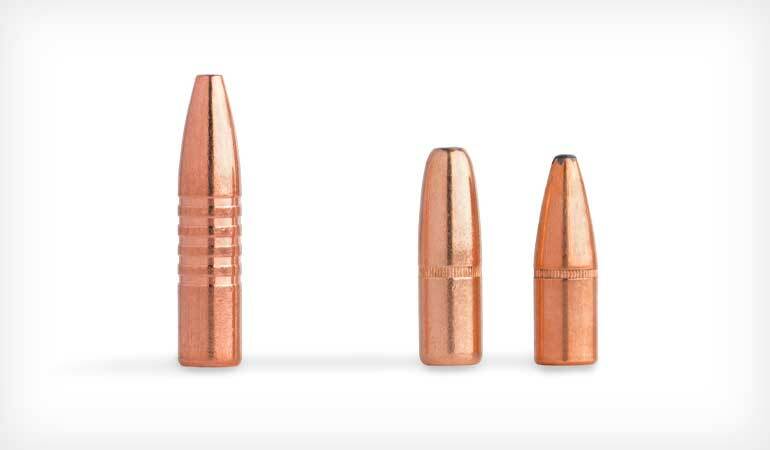 However, many African PHs have opined that an ultra-heavy 350-grain .375 bullet hits more like a .416 and for close-range use on buffalo, hippo, elephant, and the like can offer an improvement in terminal performance. Barnes, Woodleigh, North Fork, and Cutting Edge all make 350-grain .375 bullets. I’m most familiar with the Barnes TSX and Woodleigh Weldcore versions. Both are expanding designs with an amazing sectional density of .356 and provide shockingly deep penetration coupled with devastating trauma. Pair either of these as the “soft” in your cartridge belt with North Fork’s 350-grain Flat Point Solid, and you have a superbly capable combo for elephant and anything else that is gigantic, scary, and meant to be shot very close. A wide variety of bullet weights and types—such as (left to right) deep-penetrating, expanding 350-grain monometals; traditional 300-grain roundnose softpoints; and conventional 270-grain softpoints—is the magic ingredient to the .375 H&H’s versatility. Good handloads will push 350-grain bullets from a 24-inch barrel at between 2,250 and 2,400 fps, producing from 4,100 to 4,400 ft-lbs of energy. As students of ballistics will predict, this is a lower energy number than that provided by a lighter bullet pushed faster, since velocity is exponentially more valuable than projectile weight when calculating ft-lbs. An arguably more useful calculation is the Taylor Knock Out (TKO) formula. As one online calculator puts it, TKO provides a “…relative momentum adjusted for bullet diameter.” John Taylor was an ivory hunter and dangerous-game specialist of vast experience, and many savvy cartridge aficionados consider his formula more useful than typical ft-lbs figures. The 350-grain .375 bullet at 2,300 fps rates a TKO of 43, which is higher than any lighter, faster .375 bullet. 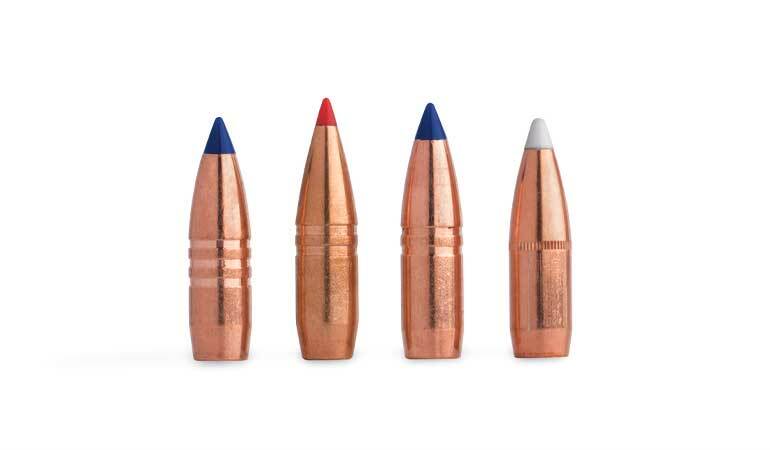 Although the zippy ultra-lightweight bullets provide flat trajectories to 300 yards or so and kill deer-size game as if struck by the hammer of Thor, they are the .375’s one Achilles’ Heel. Typically weighing 235 grains or so, they tend to mushroom massively and penetrate unimpressively. I’ve interviewed hunters who have seen even the toughest versions of the type falter on broadside shots on medium-size hogs. That’s not the bullet to have even for elk because a projectile that penetrates only 12 to 14 inches of hog may not penetrate the 30-plus inches that would be necessary should you take a quartering-away shot on a bull elk. If you really yearn for the 3,000 fps that’s possible with a lightweight .375 bullet, pick a monometal version, such as the Barnes 235-grain TSX or the Cutting Edge 235-grain ER Raptor, both of which will expand tremendously yet retain most of their weight on impact, providing decent penetration. In ballistic terms, a 235-grain .375 bullet at 3,000 fps exits the muzzle with lots of energy: 4,695 ft-lbs. That’s impressive but misleading. Taylor’s formula calculates a less-inspiring TKO number of 37. 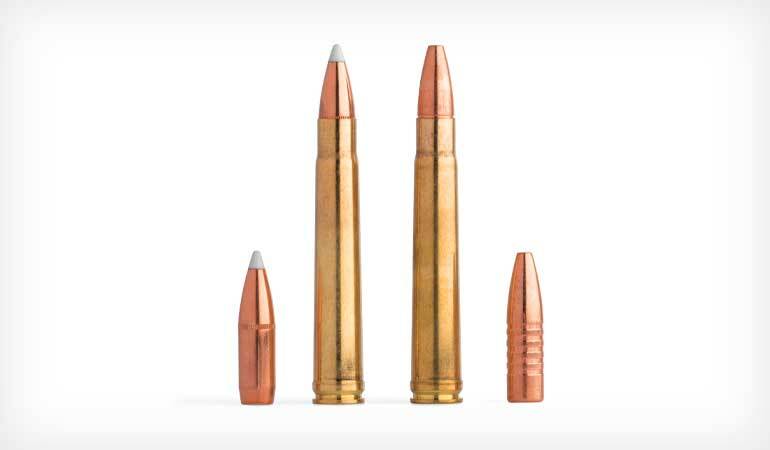 Modern high-ballistic-coefficient bullets is where the .375 H&H really steps out of its traditional box. Yes, with ultra-heavy 350-grainers it hits almost like a .416 up close, and with an ultra-light 235-grainer pushed to 3,000 fps, it duplicates the trajectory of a 150-grain flatbase big-game bullet out of the .30-06, but the sleek, high-BC, extended-range bullets take the .375 to entirely new heights. Represented by boattailed, polymer-tipped bullets like the Hornady 250-grain GMX (BC: .430; Sectional Density: .254), Barnes 250-grain TTSX (BC: .424; Sectional Density: .254), Nosler 260-grain AccuBond (BC: .473; Sectional Density: .264), and Barnes 270-grain LRX (BC: .449; Sectional Density: .274), these projectiles can be handloaded to provide more reach than the cartridge has ever had and perform splendidly on all North American game, including bison, Alaska-Yukon moose, and the biggest bears. Typical velocities range from 2,850 fps with the 250-grainers down to mid-2,700 fps with the 270-grainers, although certain powders will do a bit better. The Hornady and Barnes 250-grain monolithic bullets are twins in ballistic performance. Pick the one that shoots best out of your rifle. Offering identical sectional density and almost identical BC numbers, both can be pushed pretty fast. At a very attainable 2,800 fps, both provide 4,350 ft-lbs of muzzle energy and rate 37 on Taylor’s TKO formula. Crunching the numbers via JBM Ballistics’s online calculator shows that at standardized sea-level atmospherics, both bullets stay supersonic to 1,100 yards. More critically, both maintain at least 1,800 fps in velocity to 500 yards, which is enough to cause reliable expansion on impact. Zeroed at 200 yards, these two bullets drop about 8 inches at 300 yards, 24 inches at 400 yards, and 48 inches at 500 yards. I chose the Hornady 250-grain GMX for a DIY drop-camp Alaskan moose hunt last fall and shot a monster 61.5-inch bull with it. I picked the 250-grain GMX in case I had to shoot long because it shot accurately in my Rifles Inc. custom Model 70 (I rang a 1,000-yard steel torso target consistently with the load) and because I knew it could be trusted to work perfectly for everything from a wolf at a quarter-mile to a close encounter with an irate grizzly. Nosler’s 260-grain AccuBond bullet is arguably the most useful of the lot for all of North America’s hooved game. It’s a bit softer in construction than any of the others listed here (all monometal designs) and will shed more weight on impact, resulting in slightly less penetration but increased trauma diameter. In other words, perfect for game you want to eat, not that wants to eat you. Zeroed at 200 yards, in sea-level atmospherics, it drops 8 inches at 300 yards, 22 inches at 400 yards, and 45 inches at 500 yards. Plus, it stays supersonic to almost 1,150 yards, providing better ballistics for ringing steel than the .308 Win. with a typical 168-grain HPBT match bullet. Finally, there’s Barnes’s brand-new 270-grain LRX (Long Range X), which is probably the single most versatile of them all, in global terms. Carrying just a bit more weight and of monolithic construction, it edges into Cape-buffalo-capable territory, yet it flies flat enough for light hooved game. Importantly, it has a high enough BC to make the most of its velocity and absolutely trounces traditional 270-grain softpoint bullets at extended distances. Plus, it’s very accurate. The load I worked up for my Rifles Inc. Model 70 produces an amazing 2,827 fps with no signs of pressure, and bullets cluster like flies on the target. Muzzle energy is 4,790 ft-lbs, and it scores 40 on the TKO index. Zeroed at 200 yards, it drops about 8 inches at 300 yards, 22 inches at 400 yards, and 45 inches at 500 yards, much like Nosler’s 260-grain AccuBond. Supersonic speeds are maintained to 1,125 yards. Because they are engineered for lower-velocity impacts (down to 1,600 fps) at extended shot distances, LRX bullets expand better at low speeds than all other monometal designs and should expand reliably after impact on game at distances as far as 650 yards or so. Joseph says the best .375 projectiles for long-range hunting and shooting are (left to right) the Barnes 250-grain TTSX, Hornady 250-grain GMX, Barnes 270-grain LRX, and Nosler 260-grain AccuBond. While I’ve successfully used most brands of .375 H&H brass, I’ve come to prefer Nosler and Norma for their consistency. For primers I use Federal’s 215 Gold Medal. Because the cartridge is so beautifully balanced, it’s easy to handload and gives good performance with a vast range of medium-burn-rate propellants. Varget and Reloder 15 are two of the best (my favorite rifle absolutely loves Reloder 15 paired with Barnes bullets, putting every combo I’ve tried into less than one MOA), and H4350 and IMR 4831 are good with 300-grain bullets. For top velocities with 270- and 300-grain bullets, try Reloder 15 and Ramshot Big Game. Because the cartridge recoils stoutly, some handloaders like to crimp to prevent bullets in the magazine from creeping during repeated shots. I’ve not had problems with this; if I crimp, it’s in an effort to reduce velocity extreme spread—a technique that sometimes works wonders with big-bore cartridges. If you do crimp, be sure to trim your cases to perfect length using a premium trimmer that will square the case mouths properly. A square case mouth crimps evenly and releases the bullet base consistently; a crooked mouth may cause issues. The .375 H&H is an easy cartridge to handload, and according to the author, medium-burn-rate powders are ideal for it. Most of the scopes mounted on typical .375 H&H rifles aren’t appropriate for long distance. However, it’s not practical to use a massive precision scope because these rifles are often used on dangerous game up close and personal. I’ve used two scopes with splendid results. The one on my custom .375 H&H is a Nightforce ATACR 2.5-10X 42mm with an MOA reticle. I like the fact that it has a magnification range low enough for close work on dangerous game and high enough for precision work at 1,000 yards. It also has a parallax adjustment that helps at extended distances. The second scope is Leupold’s excellent VX-6HD 2-12X 42mm, which is a superbly versatile optic and offers unsurpassed clarity. Both scopes have capable turrets well suited for dialing up for distant shots, plus easy-to-use zero-stop-type mechanisms. Not every .375 H&H rifle should be pressed into service for shooting past 200 yards. Stretching out as far as 600 yards on game and 1,000 yards on steel targets takes a special rifle. Mine was built by Lex Webernick of Rifles Inc. He rebarreled a Winchester Model 70 magnum-length action, skip-line fluted the barrel, installed his Quiet Slimbrake II, tuned the action, installed a Timney trigger, Cerakoted it Graphite Bronze (his own blend), and bedded it into one of his handmade superlight carbon-fiber stocks. Even though it’s very light for a .375, with loads it likes, the rifle puts bullets into sub-MOA groups. Two factory loads achieve this level of accuracy: the Barnes VOR-TX 300-grain TSX and the Nosler Trophy Grade 300-grain AccuBond. Both are wonderfully versatile bullets, and I’ll cheerfully use either for just about anything that doesn’t require a solid. For the ultimate all-purpose combo, try pairing a light, fast, 250- to 270-grain load with a tough 300-grainer. Often, with the light big-game bullet zeroed at 300 yards, the heavier dangerous-game projectile will impact on point of aim at 100 yards. Packing the two loads—and knowing their trajectories—enables a hunter to reach out and crack a caribou, elk, or wolf at a quarter-mile or authoritatively sort out an irate grizzly in camp.